A violinist of great range and energy, Salley Koo has performed internationally as a solo and chamber musician. 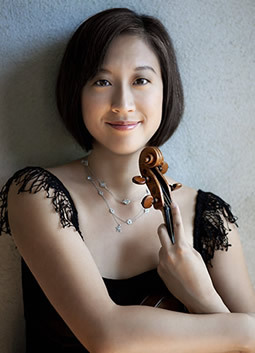 Hailing from Chicago where she studied at the Music Center of the North Shore (now Music Institute of Chicago), Ms. Koo earned her undergraduate degree from Harvard University in English and American Literature where she continued her violin studies with Lynn Chang. She subsequently received a Master of Music and pursued Artist Diploma work from Yale under the tutelage of Peter Oundjian. Ms. Koo completed her Doctor of Musical Arts in violin performance at Stony Brook University under Pamela Frank and Philip Setzer. Over the course of her extensive training, she has studied with numerous other luminaries, including Almita and Roland Vamos, David Taylor, Sylvie Koval, and Dorothy Kitchen. Ms. Koo has cultivated an active concert presence, appearing as both soloist and orchestral performer with many notable orchestras across the country. Recent performances include appearances at Carnegie Hall, Town Hall, the Kimmel Center in Philadelphia, as well as the Ravinia, Skaneateles, and Caramoor Festivals. Upcoming concerts include tours with banjo artist, Bela Fleck, soprano, Dawn Upshaw, and appearances at Peoples Symphony Concerts, Music Mondays, across the United States, and in Dresden, Baden Baden, Salzburg, and the Musikverein in Vienna. She is regularly invited as a guest artist with groups such as the Minnesota Orchestra, Orchestra of St. Luke’s, East Coast Chamber Orchestra, and the Knights, and has served as concertmaster for the Civic Orchestra of Chicago and the Tanglewood Music Center Orchestra. Salley is also a familiar face at numerous festivals including the Silicon Valley Music Festival, Yellow Barn Music Festival, Taos School of Music, the Tanglewood Music Center, Pacific Music Festival, and Thy Chamber Festival in Denmark. Ms. Koo’s engagement with the chamber music community in particular has yielded collaborations with world-renowned musicians including Peter Frankl, Yo Yo Ma, Colin Carr, as well as with members of the Orpheus Chamber Orchestra, Peabody Trio, Emerson Quartet, Takacs Quartet and the symphony orchestras of Los Angeles, San Francisco, and Chicago. Her expansive musical interests range from early music to contemporary compositions. In the former vein, she has performed in collaboration with Robert Mealey; in the latter, she has worked closely with composers like Julia Wolf, Mario Davidovsky, Steven Mackey, Osvoldo Golijov, as well as members of the So Percussion Quartet. Despite a performance itinerary that has covered North America, Europe, and East Asia, Ms. Koo has established a thriving teaching career in her own right. She has served as the violin professor and coordinator of chamber music at the University of Connecticut, in Storrs, CT; other faculty appointments include the Apple Hill Center for Chamber Music in New Hampshire, Dwight-Englewood String Society in New Jersey, Vermont’s Chamber Music Intensive Program at Yellow Barn, the Opus 118 We Want Music! 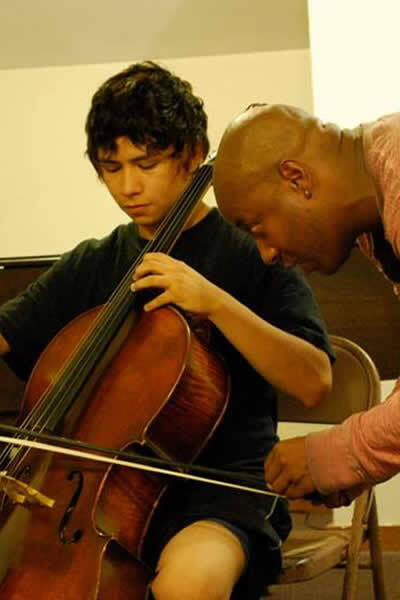 program in East Harlem, New York, Elm City ChamberFest, and the Neighborhood Music School in New Haven, Connecticut. Ms. Koo also maintains a limited private studio in New York City. Ms. Koo currently performs on a violin made for her by Mario Miralles.